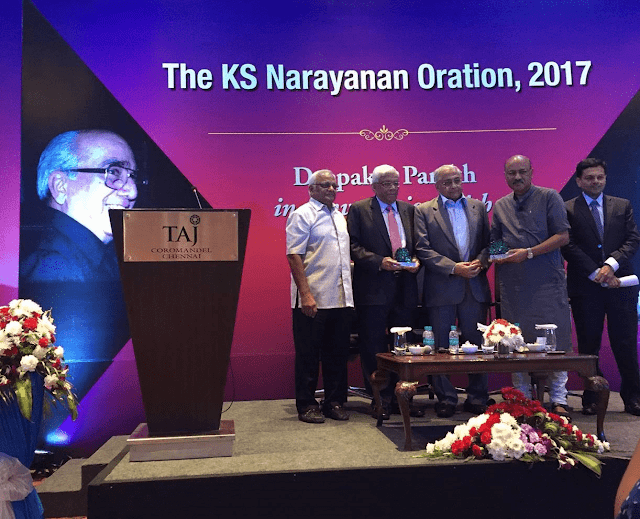 The 2nd KS Narayanan Oration – 2017, held in Chennai was as spectacular as was the depth of the speakers invited to celebrate the Birth Anniversary of Mr. KS Narayanan. Mr. Deepak S Parekh, Chairman of HDFC and well known journalist Mr. Shekhar Gupta, Chairman and Editor in Chief, The Print, were the chief invitees. Welcoming the elite gathering, Mr. N. Sankar, Chairman, SANMAR, said, “30th January is the day to remember and pay homage to my late father whose passion and foresight has made The SANMAR Group what is today. We commemorate this day as a tribute to the multifaceted patriarch of the SANMAR family. Mr. N. Kumar and Mr. Vijay Sankar of The SANMAR Group were also present. Mr. Parekh in his inimitable style mentioned that the Indian Economy would sustain and grow in spite of all the issues we are facing today. According to him there are four key elements of growth - private consumption, private spending, government expenditure and exports. Out of these four elements, exports and private spending are not working. 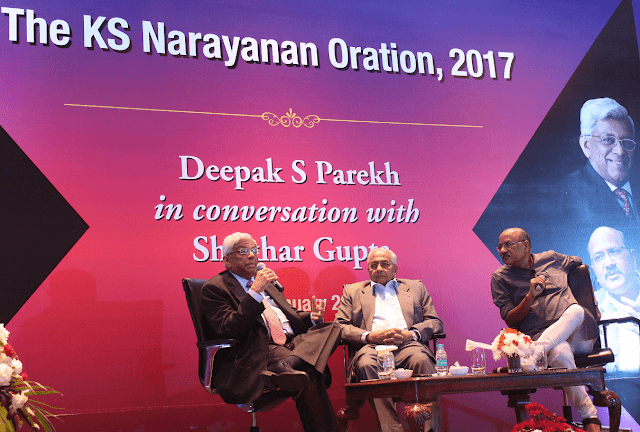 On a question posed by Mr. Shekhar Gupta on demonetization and its impact, Mr. Parekh said that, “It is a temporary pain and in two-three months things will be normal again.” He also believes that “The government must have concentrated on Income tax which would have been more fruitful in repairing the economy rather demonetizing currency”. “The business in January is better than it was in December. Indians have invested about ₹10,000 crore a month in mutual funds, particularly equity-linked funds over the last couple of months.” says Parekh. On addressing the IDBI issue, Mr Parekh said that “The private sectors banks get support from their boards and even if there is a mistake, the onus is not on one person. But in PSUs, it’s a problem”. The oration’s main objective is to bring together people from diverse backgrounds to spend an evening of learning and bonhomie representing the core spirit of KSN’s personality. During the inaugural edition, the oration was dedicated to the sport of Cricket, as it was a part of the celebration of the SANMAR family’s association with Jolly Rovers Cricket club for over 50 years. The Captain of the English Cricket Team David Gower, spoke on the topic of “Lessons from the Cricket Field” after which a discussion on “Whither Cricket?” with Former Indian Test Cricketer Aakash Chopra was held. This oration was to remember Mr. KS Narayanan, Chairman Emeritus, The SANMAR Group. KS Narayanan was an astute entrepreneur, quick to sight opportunities, had an excellent understanding of technology, superior people skills, wisdom and wit in the face of challenges. His wide interests travelled beyond business and included a keen passion for sports such as cricket and Tennis.